Where do great brands come from? Iconic brands often seem like they’ve always been great. That myth is propagated by both companies and agencies. It’s the branding equivalent of the dying myth that success stories come from nowhere and are largely led by individuals rather than by communities. An often overlooked part of the answer is hidden in plain sight within the question: Where? One of the earliest roles of a brand was to signify origin. To this day, provenance plays a vital role in many brand narratives. In categories, such as food, fashion and pretty much anything with a design angle, provenance is always a fundamental ingredient these brands use to engage with consumers and position themselves among their peers. When it comes to Italian Gelato, French Champagne (from Champagne, naturally), Savile Row suits etc., provenance is used as shorthand for the authenticity and heritage that product heralds. It’s tempting (but naïve) to think that in a globally networked market the question of origin is no longer as important as it once was. However, with people having more access than ever imagined to information about brands, it has arguably become even more important. It can still signify quality, authenticity and character but additionally, it now relates to new selection drivers such as environmental sustainability, social responsibility and ideological compatibility. The global, cosmopolitan consumer may still seek out the international superstar brands, but these brands are successful because their provenance equity is built in. Globalisation is actually one of the main drivers of the importance of provenance. Some brands may appear to rely on provenance less, especially if they have already made it. However, those successful brands have hardly jumped, Athena-style, out of someone’s forehead fully formed and armed to the teeth with equity. We all come from somewhere and brands are no exception. You may think strong brands don’t rely on their nationality for their sense of identity, but you’d be wrong. For Example: Paul Smith became a quintessential British Brand by accentuating a certain set of British traits. While it has become bigger than its own provenance, it still maintains that connection with collection names like “The British Collection” and “Paul Smith London” or by using British iconography on various items and accessories (Union Jacks included). You could say that while Paul Smith flies its own striped flag high, its family crest certainly includes a prominent Union Jack. The Japanese, who have a soft spot for Britain, are just one major market for Paul Smith who can’t get enough of it. Something interesting happens when a brand with strong provenance becomes that big. Now, it seems Paul Smith is feeding back into “Brand Britain” by advancing our nation’s reputation for design excellence and a style combining the classic with the quirky. When that happens, many British-aligned brands in effect tap into Paul Smith’s global success. It’s no secret that the Mini is owned by BMW nowadays (although still made in Cowley, Oxford). There’s even a certain poetry in the fact that the Mini is now giving back to German engineering, which inspired many of the original features of this “British Volkswagen”. However, the reason Mini was seen as an asset for BMW to begin with, is that it has always been a retro-cool British icon with starring roles in quintessential British films like “The Italian Job” (talk about classic and quirky combined, even just in that title). Unsurprisingly, the re-launch included whole model lines with a Union Jack livery scheme. 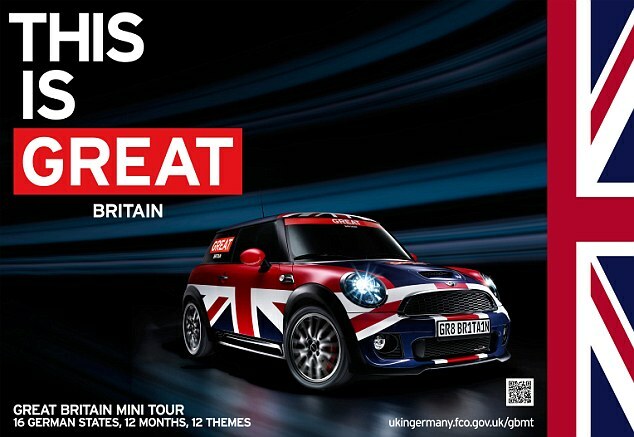 Furthermore, when BMW first launched the new MINI, it went as far as investing in a new 2003 production of The Italian Job, resulting in what Pulitzer prize winning film critic, Joe Mogentern, called “the best car commercial ever”. A decade later, as recently as 2013, when that year’s “New MINI” was launched, it was launched with the reference to provenance literally written into the background. The crucial role of provenance in the story of a brand – its past, present or future, makes federated provenance brands, such as “made in” and “product of” brands quite interesting. They let brands of all sizes come together to share, discuss and celebrate their common strengths and communicate them to the world. Once some of those brands pass a certain level of notoriety, the power shift described above may occur and they then give back into that collective power-association pool. So “Made in Britain” is at once an asset to many brands and a way for them to engage with the changing definition of what it means to be British. When my team at The Partners was approached to create a new brand for the “Made in Britain” campaign, we felt privileged to get such a rare opportunity to support both today’s and tomorrow’s British success stories. We knew using the flag wasn’t enough and risked looking dated, which is why our use of it is highly untraditional, controversial even. The brand is inspired by the flag but through the flexibility of colour, the cropping, its functional use as a directional device and the ability of the system to adapt the marque to live across every imaginable application or context, it also sends a contemporary and progressive message. All the while being crystal clear about provenance. The brands joining the campaign don’t do it because they feel their own identity is too weak. They do it because they realise Britishness plays a strong part in their identity just as it plays a part in our own identities as individuals. It’s part of the ongoing dialogue we are having as a nation. It’s a debate of both our similarities and differences. Of where we are headed and how far we have come. Commerce plays a part in that definition. Companies and their customers are looking for something to rally around. Not in order to relinquish their individuality, or to dwell on the past, but as one of the many ways they embrace forming an identity, connecting it to a rich tapestry of community and history. Today’s networked consumers are empowered. They don’t care less, they care more, about everything. And so, brands also start caring, they realise they are not merely labels or communication platforms. Rather, they are jointly conceived cultural metaphors and engagement interfaces. They are part of the cultural ecosystem. They help define it, engage with it, are influenced by it and come together to make the most of it. So no brand is an island. Certainly not those from our own island nation.